[0:00] <gordonDrogon> right. zed time for me. [0:02] <linguini> rikkib: Your cam? [0:04] <Raynerd> Haha.. They aren't mine like! [0:05] <Raynerd> I personally have 1! [0:06] <linguini> rikkib: Ah, how do you get the images to stop? [0:07] <Raynerd> Is Nefarious a regular on here... He has helped me out immensely this evening! [0:08] <liamstask> has anybody successfully monitored a mic input via pulseaudio? i am able to record and playback from this usb mic, but when i use pulseaudio's loopback module to connect the mic with the system audio sink, i don't hear any output. [0:09] <liamstask> `pactl stat short` shows the total allocations increasing, as though it thinks it's processing audio, but i don't hear anything. [0:09] <basti> i can change the position of a servo with ChangeDutyCycle at 12.5 and 7.5, but it wont move at 2.5. is the servo not working correctly, or what might be wrong? [0:10] <liamstask> rikkib: yea, and the usb system has been a little prickly as well. any alternatives you might be able to suggest? [0:15] <linguini> So, assuming I get the wires I need to connect to the GPIO pins, and I get some sort of switch between them, which pins could I put them on? Any two? [0:16] <linguini> http://wiringpi.com/pins/ shows me names for pins, which I assume can be polled/accessed programatically from a daemon..? [0:22] <shiftplusone> Hell R2 is as well, but I think it's a good idea anyway. [0:23] <Raynerd> Guys, I'm enjoying using my pi but the only thing incredibly slow is Midori - is this the case for everyone or have I an issue? [0:23] <shiftplusone> until 'web' comes out properly, I guess. [0:24] <Raynerd> shiftplusone: Ok, what is web ? [0:26] <shiftplusone> ShorTie, They do have internal pull-ups, yes. [0:31] <Raynerd> I'm running a .py script and when an error is returned from a website the script stops. Is there any way to tell it to ignore the error return and just keep running? [0:31] <shiftplusone> what does the script look like? [0:32] <rikkib> does python have a catch statement? [0:32] <Raynerd> shiftplusone: Sorry, it is the twitter one again! When twitter returns an error saying it couldn't post, I don't mind, I just need to it keep running and try and again. [0:34] <shiftplusone> Raynerd, do you understand what try does? [0:37] <Raynerd> Ok. Well line 192 sends the data to the twitter script. I'm wondering actually if the try should go in the twitter script that actually makes the post! [0:37] <linguini> https://www.youtube.com/watch?v=Bqk6M_XdIC0 is helpful. The only part I don't get is: where's the ground? [0:54] <shiftplusone> linguini, what do you mean by "where is the ground"? [1:18] <rikkib> Is the Marsboard A10 any good? [1:47] <[Saint]> I believe with some slight "surgery" you can run the camera in a form of macro mode - by removing the lens entirely. [1:49] <[Saint]> I have the camera, and a pi noir version, and I've used them both precisely once each. [1:50] <[Saint]> I should get around to using it/them. [2:52] <neirpyc> If I were looking for something to run on my Pi so that it's always connected to IRC and I can remotely connect to it from my laptop/elsewhere when I want to chat, what would I be looking for? [3:04] <Demon_Jester> Hey guys, I installed reaver on my raspberry pi, I am using raspbian as the OS, when I try to get wash to search for wps routers, its not finding any even though my router I have is wps enabled is not being picked up.. any ideas? [5:37] <rikkib> Woot 5 of my six rpi are up and running.... One nfs root card to set up and associated nfs server directory. [6:17] <TheEmpath> i think i have all the sound setup properly, but i get no noise from it. [6:31] <rikkib> My rpi have not made a sound for many months but when I did make it go it worked. [7:01] <rikkib> Ok what did you do? [7:49] <chunkyhead> i bought netgear 150 wifi adapter, it doesn't seem to work on my rpi, help? [8:15] <chunkyhead> even to run the wifi-adapter i need to run some commands. plus the wifi-adapter needs to connect to a network which in most cases would require password, how do i enter that? [8:23] <chunkyhead> how does this sound? [8:29] <chunkyhead> and that would go into /etc/rc.local or inittab right? [8:31] <chunkyhead> wicd curses there on arch? [8:35] <chunkyhead> will keep them in mind. [12:34] <Husar> hi, download do not work at this moment, where else can I download noobs from trusted source? [12:39] <SebSemmi> hello, which starter for the raspberry pi would you guys recommend? [13:53] <trijntje> is the torrent tracker at raspberrypi.org down for everybody? [14:48] <bsilvereagle> just installed Raspbian, and I guess I need some PGP keys to use apt-get, anyone know where I can find those? [14:49] <bsilvereagle> straight dd of the Raspbian image to an SD card, how much more normal can you get? [15:09] <edjuh> trijntje en tijntje, something blooming? [15:17] <koshie> Is it a good idea to overcloack the raspberry pi? For example under Turbo, just Medium or High? It'll improve a lot performance or just a little bit? [15:20] <koshie> It'll be a webserver with nginx, some stuff as etherpad and personnal website. Plus I'll use XBMC on it. [15:20] <Encrypt> koshie, Not at all then! [15:20] <koshie> Encrypt: it'll improve nothing? [15:22] <bsilvereagle> Encrypt: I never said you did, but now you know what to do in case you do. [15:23] <koshie> Encrypt: why? Energy economie? [15:25] <koshie> Encrypt: how did you do that? [15:34] <koshie> There is a kind of «lag» when it's stopping idling? [15:36] <Encrypt> It immediately goes to the normal frequency;..
[16:14] <robertj> hey all, anyone here mucked about much with HDMI-CEC? [16:35] <Perdouille> Is there a way to convert an USB drive (NTFS) to Ext3 without formatting ? [16:36] <ppq> why ext3, btw? [16:37] <pksato> have at least 50% free space? [16:38] <McScruff> is it powered externally? [16:39] <McScruff> without the keyboard is it still laggy? [16:43] <Perdouille> I'll be able to access it without the driver ? [17:06] <aaa801> gordonDrogon: You there! [17:11] <aaa801> urgha, chips not showing..
[17:23] <aaa801> this is unacceptable. [17:53] <Gates> any ideas what i cold be doing wrong? [17:57] * ShorTie thinkz it's all in that 1st line, lol. [18:01] <ReggieUK> TheEmpath, what about turning on the AGC on the mic? [18:34] <gordonDrogon> Gates, what are you trying to do with the gpio ? [18:39] <gordonDrogon> aaa801, yes - if you use the wiringPi extension then pinMode "just works". [18:39] <aaa801> gordonDrogon: it says not found ? [18:40] <gordonDrogon> is what INPUT_PULLUP ought to be. [18:41] <gordonDrogon> it's PUD_UP, _DOWN or _OFF. [18:41] <gordonDrogon> Gates, even if not using wiringPi, installing is handy for the gpio command - which will let you test stuff from the command line. [18:53] <gordonDrogon> aaa801, you need a wiringPiSetup() of some sort. [18:55] <gordonDrogon> yea, to be honest all you'll miss without the *Setup is millis() not working correctly. [18:56] <gordonDrogon> don't suppose you need to call initIO() in main() ? [18:57] <gordonDrogon> releaseIO sets all pin modes to input. [18:57] <gordonDrogon> maybe you need some as outputs to send commands? [19:06] <Gates> gordonDrogon: Is there a way to determine if my Pins are bad? [19:07] <Nikon> Anyone know of a dual bluetooth/Wireless g or n card? [19:07] <gordonDrogon> Gates, yes - mostly. [19:07] <gordonDrogon> Gates, you need to get & install wiringPi, then run the pintest program in the gpio directory. [19:08] <gordonDrogon> make sure nothing is connected first. [19:12] <gordonDrogon> Gates, you know how to type and ask for help..
[19:13] <Gates> oh cd ..
[19:15] <v0lt_> wich os do you suggest: openelec or raspbmc? [19:16] <gordonDrogon> Gates, it means wiringPi isn't correctly installed. [19:16] <gordonDrogon> make sure gpio -v returns something sensible. [19:20] <gordonDrogon> so your gpio is working fine. [19:20] <gordonDrogon> ... as far as we can te..
[19:21] <Gates> run the test with the circuit setup? [19:22] <gordonDrogon> not quite but we can use the gpio command to test your button circuit. [19:23] <gordonDrogon> the gpio command can help you test your gpio connections from the command line. [19:23] <gordonDrogon> is it just a single button? [19:23] <gordonDrogon> ok - first we need to know that we're talking the same pin numbers. [19:24] <gordonDrogon> so you wire a button to that pin, then to one of the 0v lines - e.g. physical pin 6. [19:25] <gordonDrogon> that's as good a pin to use as any. [19:25] <gordonDrogon> so wire a switch to that pin, then to physical pin 6. [19:26] <gordonDrogon> how much electronics do you know? [19:26] <gordonDrogon> you will need to enable an internal pull-up resistor on the pin. [19:27] <gordonDrogon> it will read 0 when pressed. [19:30] <gordonDrogon> did it work OK at the command line? [19:31] <gordonDrogon> as there's no point jumping into code unless you know it's working first. [19:31] <gordonDrogon> otherwise you've no idea if it's your code that's not working or the button. [19:31] <basti> gordonDrogon, is there an api "version" of gpio pwmc? [19:36] <gordonDrogon> Gates, ok - time to check the code now. [19:36] <gordonDrogon> Gates, I can't help you with Python though - it's not a language I use. [19:38] <dcj123> Hello everyone I cannot get my servo motor to work with servoblaster, nothing happens. I installed it with "git clone git://github.com/richardghirst/PiBits.git" "cd PiBits/ServoBlaster" "sudo make" and "sudo ./servod"
[19:38] <bsilvereagle> is it wired correctly? [19:40] <dcj123> GND goes to the ground of a 6v battery, VCC goes directly to the battery and Signal goes to GPIO 18 on the raspberry pi, I think so. [19:40] <gordonDrogon> do you have the ervoblaster kernel module loaded? [19:40] <gordonDrogon> you're powerin the Pi off a 6v battery? [19:41] <gordonDrogon> did you connect the 0v/Gnd lines together? [19:46] <dcj123> Now all I need it write a program that will allow me to use a joystick to control the servo motor, can anyone point me in the right direction? [19:47] <bsilvereagle> is your joystick a true joy stick or is it a stick with 4 switches? [19:48] <fsphil> I keep burning my toast, can you help bsilvereagle? [19:48] <gordonDrogon> is it a USB one? [19:48] <basti> so i found an example to control my servo via the gpio cl tool. i tried to translate into the api version: http://nopaste.info/0e5271604e.html unfortunately it does not work. what did i do wrong? 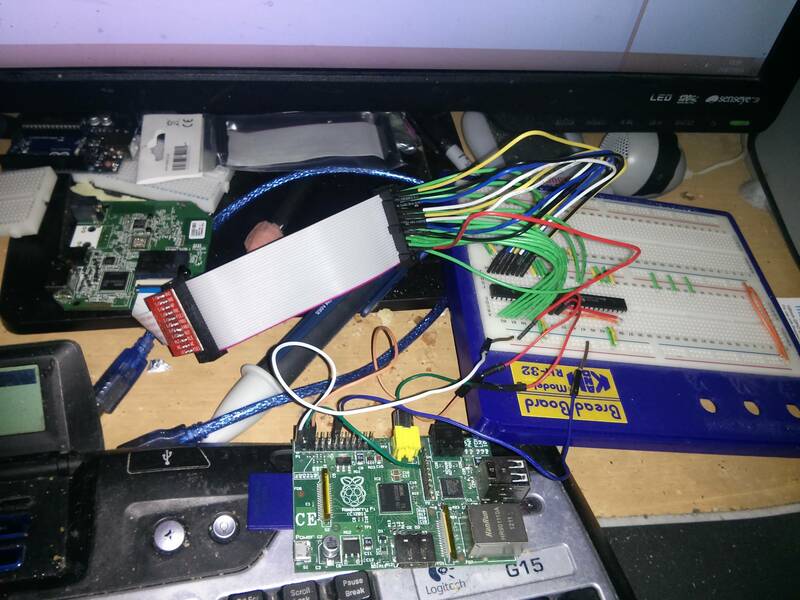 [19:50] <ppq> there's also a generic xorg driver for joysticks, not sure if that helps..
[19:54] <gordonDrogon> a quetion for you all; if you were wanting a little general purpose motor/robot driver board for the Pi, what would be a "must have" on it? [19:55] <tkonto> it looks more stable now, but is it enough? [19:55] <gordonDrogon> tkonto, 10V ? [19:55] <gordonDrogon> tkonto, you're putting 10V into the Pi? [19:56] <gordonDrogon> that's 5 too many. your Pi ought to be on fire. [19:56] <gordonDrogon> tkonto, the limit is 5v. No more. [19:57] <tkonto> It does not self-regulates consumption? [19:57] <gordonDrogon> the Pi does not have a regulator. [19:57] <daveake> It's 5V max. The end. [19:59] <gordonDrogon> ppq, I have one planned on the "big" board, but just a single channel on the "junior". [20:01] <gordonDrogon> size is a consideration for the junior - really just interested in some thoughts before I get some prototypes made up next week. [20:03] <gordonDrogon> interesting idea. possibly on the big board. would need to go to SMT to get more space. working to 55x40mm board. [20:03] <gordonDrogon> there are currently 4 LEDs on it though - just on gpio's. [20:04] <gordonDrogon> using 3mm LEDs at present. [20:04] <gordonDrogon> I have both THT and SMT layouts. [20:07] <gordonDrogon> I wonder if 2 LEDs in parallel, but back to back between the output pins would work... so one resistor, 2 LEDs. [20:08] <gordonDrogon> it's a shame those red/green LEDs only have 3 pins, not 4. [20:09] <mgottschlag> gordonDrogon: isn't that what people call charlieplexing? [20:09] <gordonDrogon> mgottschlag, no - just 2 LEDs to indicate current flow - one on each output pin. [20:10] <gordonDrogon> an H driver will have one output high and the other low, or vice versa to reverse motor direction. [20:11] <gordonDrogon> so looking at the LEDs you could tell which way the motor was turning. [20:11] <gordonDrogon> no - this is just a simle direction indicator. [20:16] <gordonDrogon> no idea what oshpark is and I'm in the UK. [20:17] <gordonDrogon> Oh. 21p for an orange green LED - 2 lead. [20:17] <gordonDrogon> bsilvereagle, ah. ok.
[20:19] <gordonDrogon> I use UK companies. [20:21] <gordonDrogon> shipping, import duties, VAT, banks rip-off charges, currency exchange rates. [20:22] <gordonDrogon> and then there's the "why should I buy from the US when the UK is perfectly good" factor too. [20:28] <mgottschlag> gordonDrogon: where in the UK do you buy your PCBs? [20:43] <gordonDrogon> that's the error. [20:44] <bsilvereagle> is atoi in stdlib? [20:44] <gordonDrogon> however you really need to do a lot of validation - make sure you have argc >= 1, etc. [20:44] <gordonDrogon> bsilvereagle, as in you don't need a special -l library..
[21:33] <gordonDrogon> one of these days you'll get an error and you might not know why. [21:33] <gordonDrogon> so check argc before you check argv. it's good programming practice. [21:50] <ShorTie> after a reboot ?? [21:51] <ShorTie> sure you got it on the right channel ?? [21:54] <designbybeck> ShorTie, do you think it might have tsomething to do with an odd resolution? [22:33] <rikkib> Six RPi up and running on my desk. Five with Jan 2014 build of wheezy. The other being upgraded now. [23:05] <edjuh> do nt hold it for this long, please ? [23:06] <edjuh> any hints on prying a 26 cable connector apart ? [23:14] <edjuh> ShorTie: pry from middle, or on sides? [23:19] <edjuh> sumfin, that's a peculiar 'mis'spelling.... east-coasty? [23:20] <ShorTie> na, it's my own creation, lol. [23:29] <edjuh> you might aprreciate the word/noun plays in it, as well as the story it self. [23:36] <edjuh> you lack anything else ?